The 1:100 Iron-Blooded Orphans line continues with an emphasis on Realistic Detail, Movable Action, and Real Frame! 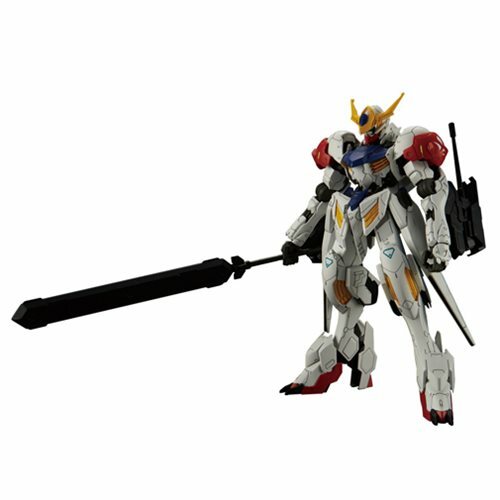 Barbatos Lupus includes a wide variety of weapons including giant sword mace, 2 arm-mounted auto cannons which can deploy just like in the animation for battle. Detail has been further enhanced both in the frame that shows the internal skeleton of the mecha and also through updated color-separated parts that allow for minute details including Tekkandan's logo on the shoulder to be made without paint. Comes with 10 Runners and a foil sticker sheet. Measures approximately 7-inches tall when complete. Ages 8 and up.